Picasso painted this the same year as Guernica. It was a prolific year for him, to say the least. The influence of his young muse had reinvigorated him. Marie-Therese was 17. They even had a daughter together. He was still married to Olga. When Picasso fell in love with another mistress, Dora Maar, Marie-Therese teemed with jealousy. Four years after Picasso died in 1977 Marie-Therese hung herself. Pictured here, in 1937, is his mistress depicted tenderly, but monstrously. 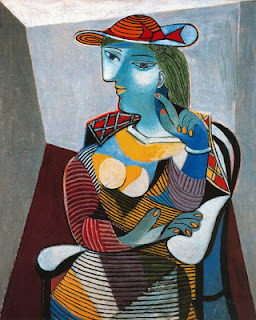 Picasso has borrowed patterns from his harlequin series, where he saw himself as a sinister trickster.